When textbook tablet startup Kno raised $46 million in September from Andreessen Horowitz and Silicon Valley Bank, it was shooting to price its dual-screen tablet at under $1,000. On Tuesday, it will announce the pricing of its tablets at $899 for the dual-screen version and $599 for the single-screen version. It will also start taking limited pre-orders for shipping before the end of the year. At $599, the single-screen tablet, will be $100 more than a WiFi-only iPad and the same price as a Samsung Galaxy Tab from T-Mobile without a contract. But the Kno is ginormous. Even the single-paned one, with its 14.1 inch screen, is nearly twice as big as an iPad. That one debuted at TechCrunch Disrupt in San Francisco (see demo video below). 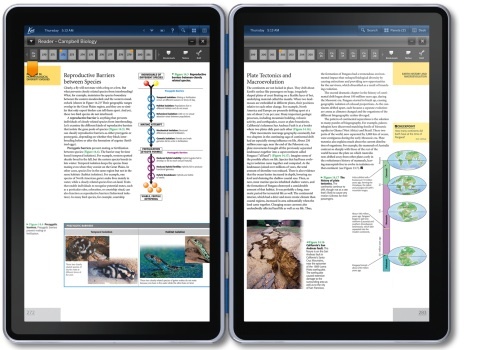 Although the Kno has a color touch-screen and runs a browser and learning apps, it is competing less with the iPad than with the extra-large Kindle DX, which sells for $379, has a 9.7-inch black-and-white screen, and also targets the textbook market. What it will come down to, though, is not so much the price of the device as much as the availability and price of the textbooks on each device. Kno CEO Osman Rashid declares that that the number of textbook titles available on the “Kindle Dx won’t be more than ours.” By the time, the Kno gets into students hands there will be tens of thousands of textbook titles for sale at 30 to 50 percent cheaper than the print editions. The Kno should pay for itself within three semesters, and students won’t have to lug around a backpack full of paper textbooks. They can also take notes on the Kno.